One of the best places for a smart camera is your front door. That way it doesn't record anything that goes inside the house, if you're wary of privacy issues, but it still lets you see who got near your home. And if that camera is replacing your doorbell, then it serves double purpose for security and convenience, letting you see who's at the front door, even if you're away, and talk to them to see what they need or let them know when you'll be back. 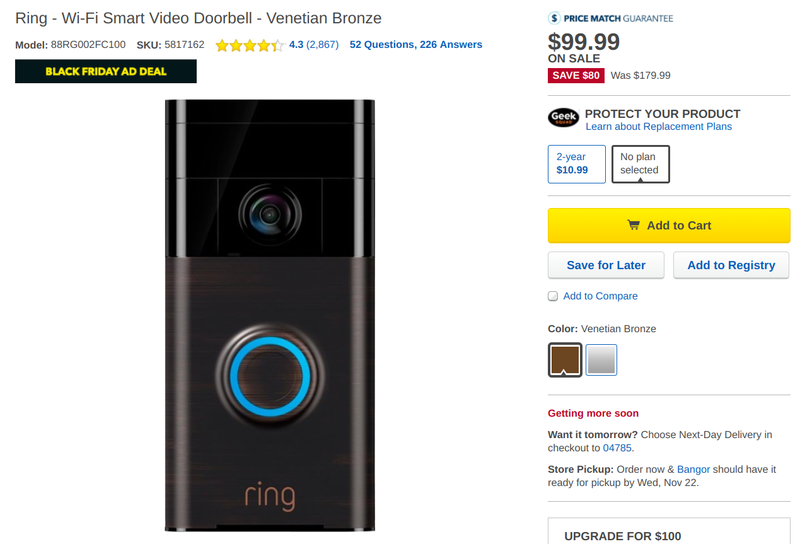 So if you're interested in a smart doorbell, you may want to take a long look at the Ring. It's not exactly the newest kid on the block, and I haven't tried it myself, but it's favorably reviewed (4.1 stars on Amazon, 4.3 stars on Best Buy), has an Android app, and integrates with Google Assistant so you can ask it for your latest notifications, check the status of your system, turn on/off motion alerts, and more. Best Buy has both the Venetian Bronze and Satin Nickel colors on discount, so you should be able to find something to work with your door. You can grab it from the link below.